BMC Air Filters, designed and manufactured in Italy, have continued development of their range of high performance OE replacement air filters for Australian 4WD vehicle applications. BMC air filters are designed to increase horsepower and give better performance to your engine, without compromising reliability. They are easy to install and ensure a higher air flow than OE filters, producing less than half the pressure drop when compared to paper filters. BMC air filters offer excellent engine protection through a high level of filtering efficiency. A special multilayer cotton filtration material guarantees containment of impurities from as small as 7 microns. BMC air filters can be cleaned and regenerated and have a general lifespan equal to that of the vehicle, saving the cost of changing the air filter each time the vehicle is serviced. The filter can even be cleaned and regenerated in the outback, with the handy aerosol service kit. The 4WD range now includes air filters for the Toyota Hilux, Landcruiser, Fortuner, FJ Cruiser and Prado, Holden Colorado, Rodeo and Isuzu D-Max, Ford F Series, Ranger, Everest and Courier, Landrover Defender, Discovery, Evoque and Range Rover, Nissan Patrol, Pathfinder and Navara, Mitsubishi Pajero, Mazda B2500, Jeep Wrangler and even the Mahindra XUV500. Due to their performance and reliability many leading Australian Supercar teams run BMC Air Filters. 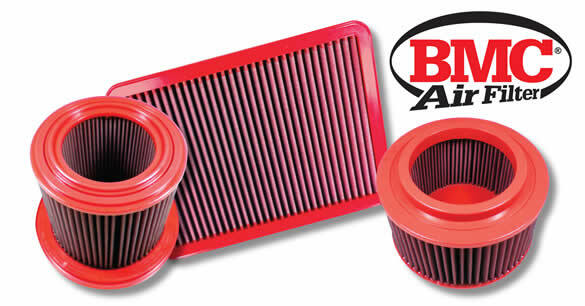 Originally developed in association with the Ferrari F1 team, BMC Air Filter is one of the most successful filters in many racing categories including 21 Formula1 Constructors and Drivers titles, Australian Supercar Champions 10 times, 9 Bathurst 1000 titles, 3 World Rally Championships, and 13 Le Mans 24 Hours titles .